Editor’s Note: this article assumes a basic knowledge of music fundamentals such as chord building and chord progressions. The ideas and opinions shared here are stated exclusively on behalf of the author. The last few articles I have posted have all been on the subject of music theory. I have been discussing some more advanced concepts of rhythm, melody, and, harmony/chords that I feel are very useful compositional tools. Today we will look at a very different harmonic concept: parallel harmonic motion. Parallel harmony does not follow the traditional rules of music theory and harmony, and many people would argue that it is wrong, jarring, not musical, etc. Seems like reason enough to find out a bit more wouldn’t you say? First of all, this topic has been discussed at length in a previous blog post, and I recommend reading it to give you some basics on the subject. Click here. 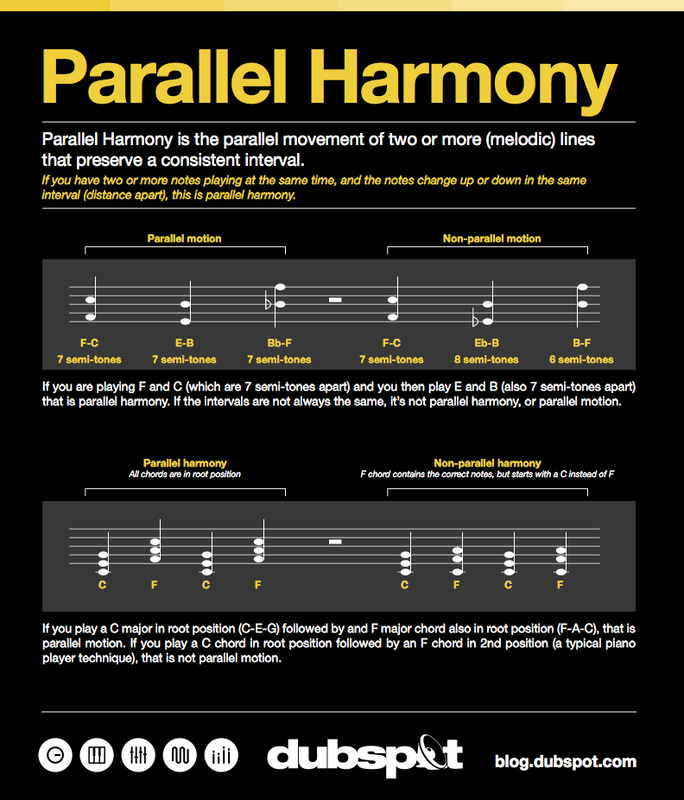 Parallel Harmony: What is it? Essentially, parallel harmony is the parallel movement of two or more (melodic) lines that preserve a consistent interval. If you have two or more notes playing at the same time and the notes change up or down in the same interval (distance apart) then you are working with parallel harmonies. An example of parallel harmony is if you are playing F and C (which are seven semitones apart) and you then play E and B (also seven semitones apart). If the intervals are not always the same, it’s not parallel harmony, or “parallel motion.” One of the reasons parallel harmony can be odd to look at (on music paper) is that even though two notes may look to be moving perfectly parallel, the uses of sharps, flats, and naturals can make for different harmonies. If you play a C major in root position (C-E-G) followed by and F major chord also in root position (F-A-C), that is parallel motion. If you play a C chord in root position followed by an F chord in 2nd position (a typical piano player technique), that is not parallel motion. One could argue that the non-parallel harmony “sounds” better. It is smoother and has shared notes, which leads to a more melodic form of harmonization. But when you are trying to achieve a certain sound or feeling, the correct way is not always best. 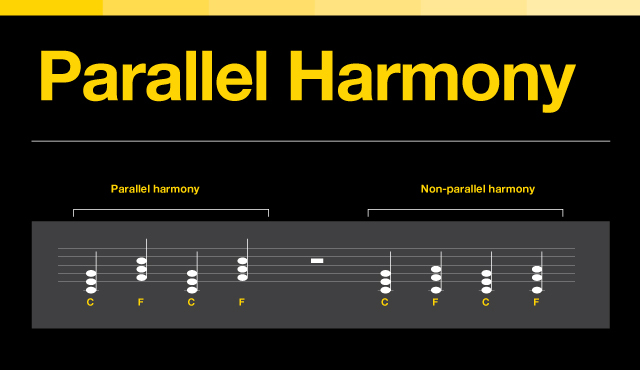 Parallel harmony has its own unique sound because all of the notes move simultaneously in a cohesive manner. If you are looking for a more ambiguous sound in your music, one in which the idea of a tonal center is a little blurred, then using parallel harmony is one way to achieve that. 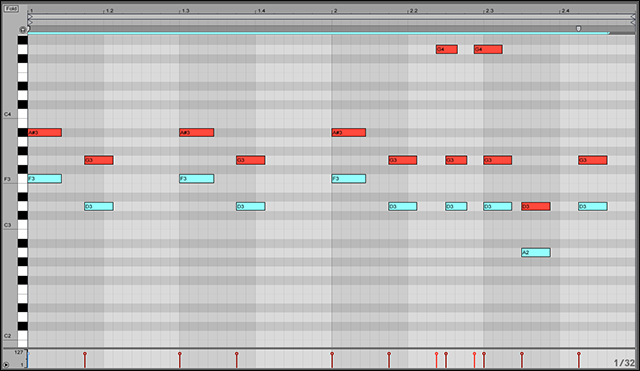 When writing melodies, we usually use notes that can be found within a particular scale. We also choose chords that are built upon the notes in that scale. When harmonizing a melody using parallel motion, sometimes the harmony notes will not be part of the scale. Also, since all the notes move in parallel, the classic harmony techniques of voice leading and resolution are thrown out the window. Question: In classical music theory, is “parallel harmony” considered acceptable? Answer: Maybe not, but that does not make it uninteresting or useless by any means! 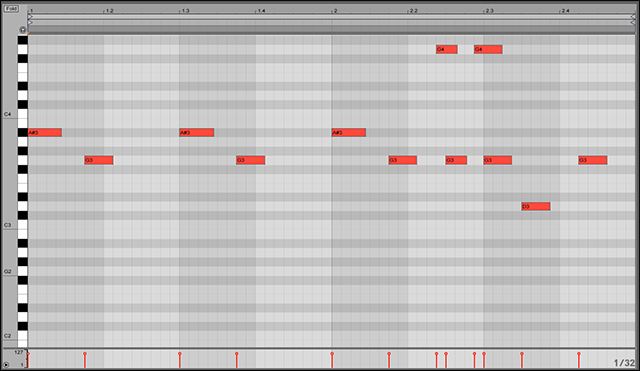 A producer would often record a clean sample of a chord and then layer it in a sampler instrument. 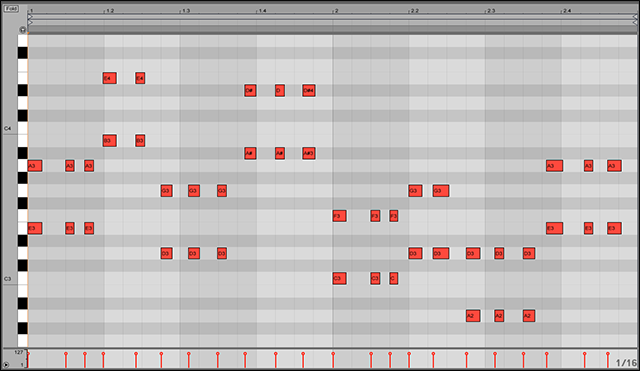 The sample is then triggered in different keys. The sound is often raw, and there are lots of audio artifacts because the sample gets compressed or stretched. This technique is a great way to achieve that classic parallel sound because as the sample is transposed to different pitches, the intervals evoked within the chord remain unaffected. This is a fancy way to say that two notes are triggered when you play one note on the keyboard. A typical example would be to detune one of the oscillators on a synthesizer by a perfect 4th (+5 or -7) or a perfect 5th (+7 or -5). This was a very common keyboard sound throughout the 70’s in fusion and progressive rock. You would play a single line on the keyboard, but every keystroke would play two notes: a 4th or 5th apart in parallel motion. The synth line in HNNY’s “For The Very First Time” is a good example of parallel motion. The syncopated rhythm of the synth hook is also fantastic and unique. One of the reasons that parallel harmony can have such a surprising sound is because of the extra overtones in each unique synth patch or sample. To explain briefly, every sound has a fundamental (or dominant) pitch. Embedded within and surrounding that fundamental pitch are many other frequencies or overtones. These additional overtone vibrations, or “partials,” give each sound its particular flavor which generally harmonically resonate with the fundamental pitch. When you use parallel motion, the harmonies evoked tend to seem very strange to us because they often use notes that do not fit in the scale or key of the song. These clashes of partials, which are sometimes not even distinctly audible, give part of the flavor that we associate with parallel harmony. Another example of parallel harmony in modern music can be heard in Lone’s “Rapid Racer,” released on R&S records. The unique sound of parallel chords make an excellent addition to any producer or composer looking for something a little different. 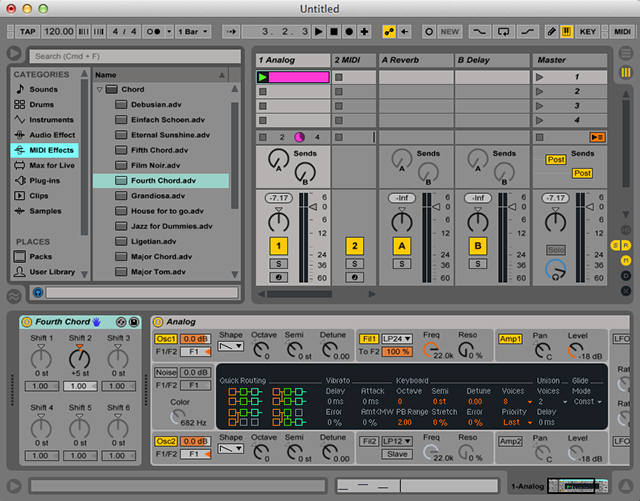 An easy and efficient way to achieve parallel harmonies in Ableton Live is to load the Chord device, set your desired intervals and then record melody progressions with one note instead of playing chords.